Eukaryotic genomes are packaged into chromatin, a highly organized structure consisting of DNA and histone proteins. Nuclear processes, such as gene transcription proceed in the context of chromatin. Disruptions in chromatin organisation allow for increased access to the DNA and can significantly alter normal patterns of gene expression, which is a hallmark of cancer and developmental defects. Therefore, it is important to understand the molecular mechanisms regulating the establishment and maintenance of chromatin structure. 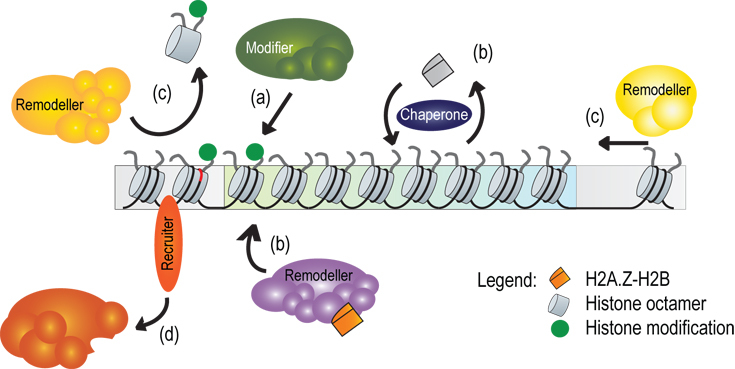 Chromatin organisation is modulated by a number of factors, including histone modifying enzymes, chromatin remodellers and histone chaperones, which act through various pathways. They may directly modify either the DNA or histone proteins (a), change nucleosome composition (b) or distribution (c), or regulate the recruitment of other factors (d).